This document was part of an alpha release and has been superseded. Open Archives Initiative Object Reuse and Exchange (OAI-ORE) defines standards for the description and exchange of aggregations of Web resources. OAI-ORE introduces the notion of a Resource Map, a named RDF Graph [RDF Concepts] which describes the Aggregation, the Aggregated Resources of which it is composed, and the relationships between them (and/or the relationships between these and other resources. A Resource Map Document is a machine-readable representation of a Resource Map. Since a Resource Map is an RDF Graph, it can be serialized using any RDF syntax. This document outlines the use of two such syntaxes for the serialization of Resource Maps: RDF/XML [RDF/XML] and RDFa [RDFa]. This specification is one of several documents comprising the OAI-ORE specification and user guide. This document has not been revised for the 0.3 version of the specifications. There may be some inconsistencies with the 0.3 Data Model. Open Archives Initiative Object Reuse and Exchange (OAI-ORE) defines standards for the description and exchange of aggregations of Web resources. OAI-ORE introduces the notion of a Resource Map, a named RDF Graph [RDF Concepts] which describes the Aggregation, the Aggregated Resources of which it is composed, and the relationships between them (and/or the relationships between these and other resources. A Resource Map Document is a machine-readable representation of a Resource Map. Since a Resource Map is an RDF Graph, it can be serialized using any RDF syntax. This document outlines the use of two such syntaxes for the serialization of Resource Maps: RDF/XML [RDF/XML] and RDFa [RDFa]. This specification uses the common term URI to mean both IRI [RFC3987] and URI [RFC3986]. The concept of the Resource Map is defined by the ORE Abstract Data Model [ORE_Model]: it is a named RDF Graph, as defined by RDF [RDF Concepts], and the characteristics of an RDF Graph that acts as a Resource Map are described by the ORE Abstract Data Model. The following table summarises the constraints on the structure of an RDF Graph that serves as a Resource Map by specifying the minimum and maximum expected occurrences of Triples of varying forms. URI-S must be directly or transitively connected to AR-i, URI-A, or URI-R in the RDF Graph defined by the triples in the Resource Map. The RDF/XML specification [RDF/XML] describes an XML format for serializing RDF graphs. In order to represent an RDF Graph as an XML document the constructs of the RDF Graph (triples made up of subjects, predicates and objects) have to be represented as components in that XML document, i.e. as XML elements and XML attributes, XML element names and XML attribute names, and as XML element content and XML attribute values. The RDF/XML specification describes such a mapping between the RDF Graph and the XML Infoset [XML Infoset]. For some features of the RDF Graph, the RDF/XML syntax permits the encoding of a single feature in multiple ways in XML. Further, as noted above, the structural constraints imposed by the ORE Abstract Data Model on an RDF Graph which acts as an ORE Resource Map mean that such a graph makes use of only a subset of the features of an RDF Graph. In the remainder of this document, this profile is referred to as the ORE Resource Map RDF/XML profile. Where an ORE Resource Map is serialised using RDF/XML, any of the conventions supported by the RDF/XML specification MAY be used; this profile is provided primarily as a guideline for Resource Map providers who are not familar with the RDF/XML format. The Internet media type / MIME type for RDF/XML is application/rdf+xml. Where the ORE Resource Map RDF/XML profile is used to provide representations of ORE Resource Maps that media type MUST be used. Broadly, the convention used in RDF/XML is that the set of subject-predicate-object triples is represented as sequences of XML elements corresponding to the subject of one or more triples (node elements) containing child XML elements corresponding to predicates (property elements) the attributes and/or content of which correspond to the objects. Since the object of one triple may itself be the subject of another triple, that pattern can be repeated, with the consequence that this convention is sometimes referred to as "striping". Neither the order of node elements within the root element, nor the order of property elements within the node element, is significant. In the ORE Resource Map RDF/XML profile, this striping is limited to one "level" i.e. a node element contains child property elements but those property elements do not contain further node elements. Also, in this profile, a node element always has the XML expanded name ("http://www.w3.org/1999/02/22-rdf-syntax-ns#", "Description"), typically represented by the QName rdf:Description, where the prefix rdf is associated via an XML namespace declaration with the namespace name http://www.w3.org/1999/02/22-rdf-syntax-ns#. In other words, this profile does not support RDF/XML's "typed node element" convention: triples with the predicate http://www.w3.org/1999/02/22-rdf-syntax-ns#type are always represented using property elements. In the remainder of this section, the names of XML elements are cited as XML QNames. The prefix used in the QNames in this document should not be interpreted as significant; any prefix can be used as long as the QName corresponds to the XML expanded name would be generated using the prefix/namespace name pairs listed in the section above on Namepaces. The attribute values may take the form of relative references, to be resolved relative to a base URI, either a URI provided by the use of an xml:base attribute or the URI of the document itself. The following example represents the same triple as the previous example. Create a property element as child element of the node element. The name of the property element is derived from the URI reference which forms the predicate of the triple, following the URI-QName mapping convention described in section 2.1 of the RDF/XML specification. If the object of the triple is a URI reference, add an attribute with the QName rdf:resource and make the value of this attribute a URI reference corresponding to the object. In this case, the property element is empty. For an XML literal i.e. a typed literal with the datatype http://www.w3.org/1999/02/22-rdf-syntax-ns#XMLLiteral, make the lexical form the content of the property element, and add an attribute with the QName rdf:parseType and make the value of this attribute the string "Literal". The remaining sections describe the encoding of each of the types of triple which form an ORE Resource Map (i.e. each of the types of triple listed in the table. The relationship between Resource Map and Aggregation is expressed by a single (required) triple in which the subject is the URI of the Resource Map, the predicate is the URI http://www.openarchives.org/ore/terms/describes and the object is the URI of the Aggregation. In the ORE Resource Map RDF/XML profile, this is expressed using a single node element with an rdf:about attribute (the value of which provides the subject, the URI of the Resource Map), containing a single property element with a QName corresponding to the predicate (typically ore:describes) and an rdf:resource attribute, the value of which provides the object, the URI of the Aggregation). The rdf:about and rdf:resource attribute values could be relative references to be resolved relative to a base URI, e.g. And if the URI of the document is the URI of the Resource Map, then the use of xml:base is not required, e.g. For reasons of brevity, these variants are not repeated in the remaining examples below, which all use the form of the second example above with an explicit base URI provided; if the URI of the document was the URI of the Resource Map, then this would not be required. The type of a Resource Map is expressed by a single (optional) triple in which the subject is the URI of the Resource Map, the predicate is the URI http://www.w3.org/1999/02/22-rdf-syntax-ns#type, and the object is the URI http://www.openarchives.org/ore/terms/ResourceMap. In the ORE Resource Map RDF/XML profile, this is expressed using a single node element with an rdf:about attribute (the value of which provides the subject, the URI of the Resource Map, using a null value), containing a single property element with the QName corresponding to the predicate (typically rdf:type) and an rdf:resource attribute, the value of which provides the object, the URI http://www.openarchives.org/ore/terms/ResourceMap. Note that other types may be assigned to a Resource Map as "optional metadata". See section 4.3.4.
one or more triples in which the subject is is the URI of the Resource Map, the predicate is the URI http://purl.org/dc/elements/1.1/creator and the object is either a plain literal or a URI. a single triple in which the subject is is the URI of the Resource Map, the predicate is the URI http://purl.org/dc/terms/modified and the object is either a plain or typed literal. In the ORE Resource Map RDF/XML profile, this is expressed using a single node element with an rdf:about attribute (the value of which provides the subject, the URI of the Resource Map), containing a property element for each triple with a QName corresponding to the predicate (typically dc:creator and dcterms:modified, respectively). Where the object is a URI, the property element has an rdf:resource attribute, the value of which provides the object, as in the previous two sections. Where the object is a plain literal, the lexical form of the literal forms the content of the property element. If a language tag is present, it is represented as the value of the xml:lang attribute. Where the object is a typed literal, the lexical form of the literal forms the content of the property element. The value of the rdf:datatype attribute provides the URI of the datatype. The first class of triple is expressed as in the previous sections, using a single node element with an rdf:about attribute (the value of which provides the subject, the URI of the Resource Map), containing a property element for each triple with a QName corresponding to the predicate, and the object as (for the URI case) the value of the rdf:resource attribute, or (for the literal case) the content of the property element (with rdf:datatype attribute or xml:lang attribute as required. The second class of triple requires the introduction of a separate node element for each distinct subject URI, with the value of the rdf:about attribute providing the subject, containing a property element with a QName corresponding to the predicate and an rdf:resource attribute, the value of which provides the object, the URI of the Resource Map). Where two such triples share the same subject URI, they can be represented as two property elements within a single node element. The relationship between an Aggregation and its component Aggregated Resources is expressed by one or more triples in which the subject is the URI of the Aggregation, the predicate is the URI http://www.openarchives.org/ore/terms/aggregates and the object is the URI of the Aggregated Resource. In the ORE Resource Map RDF/XML profile, this is expressed using a single node element with an rdf:about attribute (the value of which provides the subject, the URI of the Aggregation), containing, for each Aggregated Resource, a property element with a QName corresponding to the predicate (typically ore:aggregates) and an rdf:resource attribute, the value of which provides the object, the URI of the Aggregated Resource). The type of an Aggregation is expressed by a single (optional) triple in which the subject is the URI of the Aggregation, the predicate is the URI http://www.w3.org/1999/02/22-rdf-syntax-ns#type, and the object is the URI http://www.openarchives.org/ore/terms/Aggregation. In the ORE Resource Map RDF/XML profile, this is expressed using a single node element with an rdf:about attribute (the value of which provides the subject, the URI of the Aggregation), containing a single property element with the QName corresponding to the predicate (typically rdf:type) and an rdf:resource attribute, the value of which provides the object, the URI http://www.openarchives.org/ore/terms/Aggregation. Note that other types may be assigned to an Aggregation as "optional metadata". See section 4.3.8. The ORE Abstract Data Model permits a Resource Map to provide information about additional identifiers for an Aggregation. This metadata takes the form of zero or more triples in which the subject is the URI of the Aggregation, the predicate is the URI http://www.w3.org/2002/07/owl#sameAs and the object is a URI which also identifies the same Aggregation. The Abstract Data Model also permits a Resource Map to provide information about resources which are broadly equivalent to an Aggregation. This metadata takes the form of zero or more triples in which the subject is the URI of the Aggregation, the predicate is the URI http://www.openarchives.org/ore/analogousTo and the object is a URI of another resource. 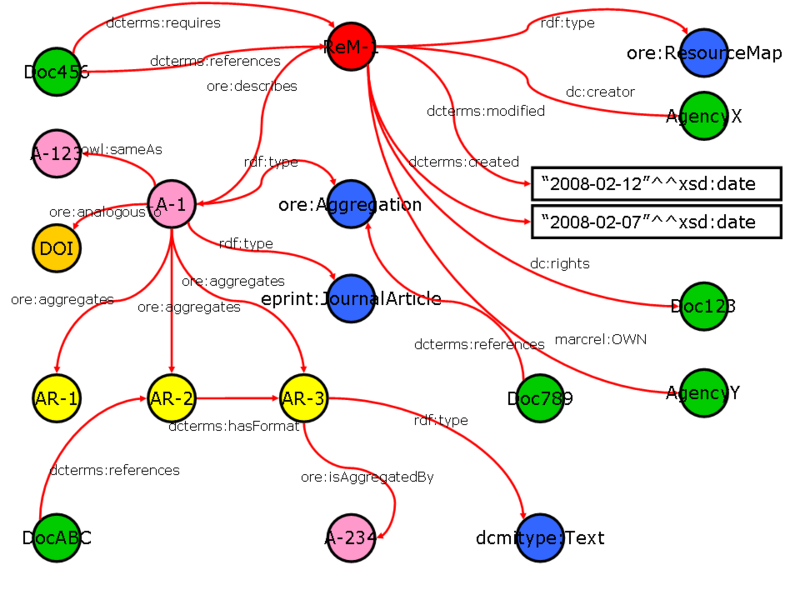 In the ORE Resource Map RDF/XML profile, this is expressed using a single node element with an rdf:about attribute (the value of which provides the subject, the URI of the Aggregation), containing property elements with QNames corresponding to the predicate (typically owl:sameAs or ore:analogousTo) and an rdf:resource attribute, the value of which provides the object, the other URI for the Aggregation, or the URI of the other resource. The first class of triple is expressed as in the previous sections, using a single node element with an rdf:about attribute (the value of which provides the subject, the URI of the Aggregation), containing a property element for each triple with a QName corresponding to the predicate, and the object as (for the URI case) the value of the rdf:resource attribute, or (for the literal case) the content of the property element (with rdf:datatype attribute or xml:lang attribute as required. The second class of triple requires the introduction of a separate node element for each distinct subject URI, with the value of the rdf:about attribute providing the subject, containing a property element with a QName corresponding to the predicate and an rdf:resource attribute, the value of which provides the object, the URI of the Aggregation). The ORE Abstract Data Model permits a Resource Map to describe relationships between an Aggregated Resource and another Aggregation, in the form of triples in which the subject is the URI of an Aggregated Resource, the predicate is the URI http://www.openarchives.org/ore/terms/isAggregatedBy and the object is the URI of another Aggregation, i.e. an Aggregation other than the one described by the current Resource Map. In the ORE Resource Map RDF/XML profile, this is expressed using for each Aggregated resource involved, a node element for each Aggregated Resource with an rdf:about attribute (the value of which provides the subject, the URI of the Aggregated Resource), containing a single property element with the QName corresponding to the predicate (typically ore:isAggregatedBy) and an rdf:resource attribute, the value of which provides the object, the URI of the other Aggregation. The first class of triple is expressed as in the previous sections, using a single node element with an rdf:about attribute (the value of which provides the subject, the URI of the Aggregated Resource), containing a property element for each triple with a QName corresponding to the predicate, and the object as (for the URI case) the value of the rdf:resource attribute, or (for the literal case) the content of the property element (with rdf:datatype attribute or xml:lang attribute as required. The second class of triple requires the introduction of a separate node element for each distinct subject URI, with the value of the rdf:about attribute providing the subject, containing a property element with a QName corresponding to the predicate and an rdf:resource attribute, the value of which provides the object, the URI of the Aggregated Resource). Need description of how to include Additional Relationships in the Resource Map. The RDFa in XHTML specification [RDFa] describes how to encode an RDF Graph within an HTML or XHTML document using a set of attributes. RDFa makes use of existing HTML/XHTML markup and content so that the same data which is typically rendered to a human reader is used as the basis of the content of the RDF Graph and the need to repeat content is minimised. Need fuller description of RDFa, examples? Where an XHTML document containing RDFa is used to serialise an ORE Resource Map, that XHTML+RDFa document MUST be a strictly conforming XHTML+RDFa document as described in section 4 of the RDFa in XHTML specification, i.e. it SHOULD be labeled with the Internet Media Type "application/xhtml+xml"
In RDFa, an RDF URI reference is always encoded as the value of an XML attribute. The attribute values may take the form of a URI in full or of a relative reference, to be resolved relative to a base URI, either a URI provided by the use of an xml:base attribute or the XHTML base element, or to the URI of the document itself. Some of the attributes used in RDFa also support the encoding of a URI in an abbreviated form as a CURIE. The use of a CURIE allows the author to replace the leading section of a URI with a substitution token which is mapped to a URI. The full URI represented by a CURIE is obtained by concatenating the second part of the CURIE onto the URI to which the substitution token is mapped. The mapping of substitution token to URI is expressed using an XML Namespace declaration. This mechanism is quite similar to that used in RDF/XML to map URIs to XML QNames, with the important difference that the lexical constraints on CURIEs are less stringent than those on QNames, so that any URI can be abbreviated as a CURIE, whereas, as noted above, there are some URIs which can not be mapped to QNames. @href and @src support only a URI. @property, @datatype and @instanceof support only CURIE values. @rel and @rev support both XHTML link types and CURIEs. Add some examples of URIs in RDFa. <p>This Resource Map describes an <a rel="ore:describes"
<p>It was last modified on <span property="dcterms:modified" datatype="xsd:date"
<p>The rights held in this Resource Map are described by <a rel="dc:rights"
<p>It was last created on <span property="dcterms:created" datatype="xsd:date"
<p>It is referenced by <a rev="dcterms:references"
<p>It is required by <a rev="dcterms:requires"
<p>The Aggregation is also identified by the URI <a rel="owl:sameAs"
<p>The Aggregation is analogous to the resource <a rel="ore:analogousTo"
<p>The Aggregation is a <a rel="rdf:type"
<p>The Aggregation is referenced by <a rev="dcterms:reference"
available in a different format as <a rel="ore:isAggregatedBy"
Need description of how to include Additional Relationships in the Resource Map in RDFa. DCMI Metadata Terms, DCMI Usage Board, 2008-01-14. Named graphs, provenance and trust, J. Carroll, C. Bizer, P. Hayes, P. Stickler, Proceedings of the 14th international conference on World Wide Web, 2005. ORE Specification - Abstract Data Model , C. Lagoze, H. Van de Sompel, M. Nelson, R. Sanderson, S. Warner, 2007. Available at http://www.openarchives.org/ore/datamodel. Latest version available at http://www.w3.org/TR/rdfa-syntax/. IETF RFC 2119: Key words for use in RFCs to Indicate Requirement Levels , S. Bradner, March 1997. Available at http://www.ietf.org/rfc/rfc2119.txt. Uniform Resource Identifier (URI): Generic Syntax, T. Berners-Lee, R. Fielding, L. Masinter, IETF RFC3986, January 2005. Internationalized Resource Identifiers (IRIs), M. Duerst & M. Suignard, IETF RFC3987, January 2005. SPARQL Query Language for RDF, E. Prud'hommeaux, A. Seaborne, Editors. W3C Recommendation, 15 January 2008. Architecture of the World Wide Web, Volume One, I. Jacobs and N. Walsh, Editors, World Wide Web Consortium, 15 January 2004.